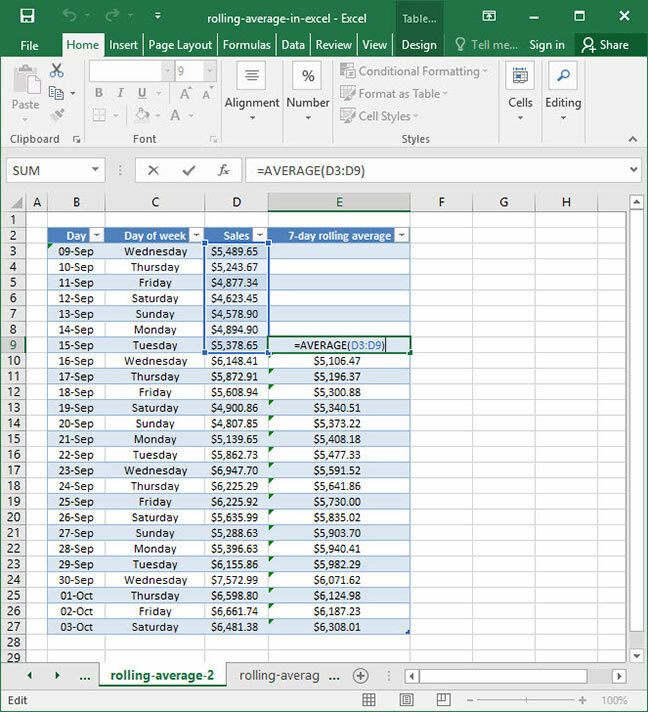 Calculating a rolling average (also known as a moving average) is easy in Excel using the AVERAGE formula combined with absolute and relative cell references. A rolling average helps smooth out trends over time, particularly when your data shows cyclicality by week, month, or year. 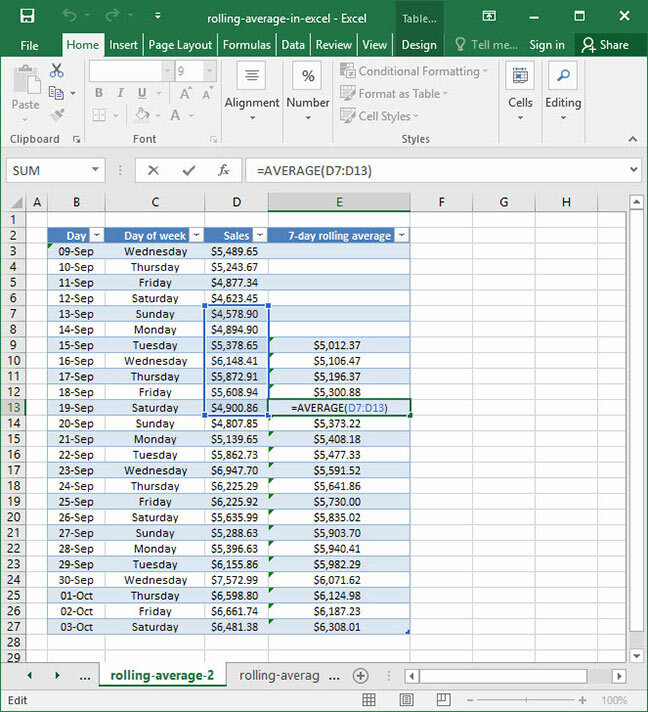 Let's take a look at what rolling averages are, and how you can calculate them in Excel. If you're not familiar with the difference between relative and absolute cell references, take a look at our cell references tutorial before proceeding! What is a rolling average? A restaurant wants to figure out whether its number of daily customers is increasing or decreasing. However, the restaurant always receives more customers on the weekends — so comparing the number of customers served on a Tuesday to the number of customers served on the previous Saturday is deceptive. Even though the number of customers served may go down, this might be due to the fact that it's a Tuesday — not due to the fact that the restaurant is actually doing less business. A retail manager wants to figure out whether her store is selling more toys each month. She compares December sales to February sales and sees a significant decrease. However, she thinks this data may not be representative of actual sales trends, because the retailer always sells a lot of toys around the holidays. The restaurant can take the average number of customers served for each day over the past seven days on a rolling basis. So on Saturday, the restaurant will average data from the previous Sunday through Saturday; on Tuesday, the restaurant will average data from the previous Wednesday through Tuesday. This rolling average assures that a full week of data is always accounted for, allowing for accurate comparisons across weeks. The retail manager can calculate average monthly sales for the past year on a rolling basis. So in December, she will average data from the previous January through December; in February, she will average data from the previous March through February. This provides her with a more accurate, "rolling" picture of yearly sales as time progresses that controls for seasonality in the sales cycle. In short, rolling averages are used to smooth out data over a significant period of time and account for seasonality and cyclicality in trends. 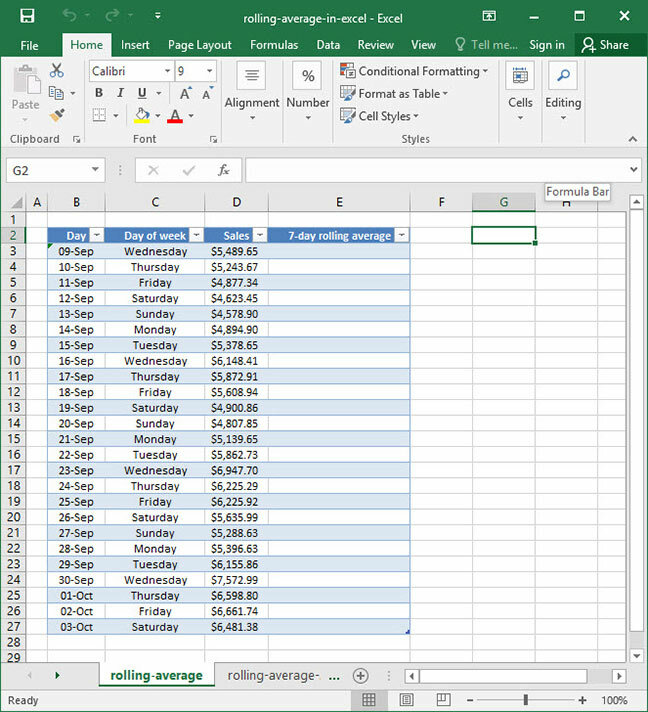 Calculating a rolling average manually in Excel is simple: we create a new column, use the AVERAGE function to calculate an average over a specified period of time, and take advantage of Excel's relative cell reference functionality to ensure that our average moves as our data set progresses. First, we start entering our formula in cell E9, because September 15th is the first day on which we have a full seven days of data to average. It wouldn't be possible to take a 7-day rolling average starting on September 14, because we have only collected six days of data at that point. Whenever we calculate a rolling average using this method, we'll need to exercise manual judgement to figure out where in our data to start. With our rolling average calculation, we can clearly tell that weekly sales are trending consistently upwards. This method of calculation has drastically simplified a set of data that was otherwise very difficult to interpret. Don't see the Data Analysis option on the menu? 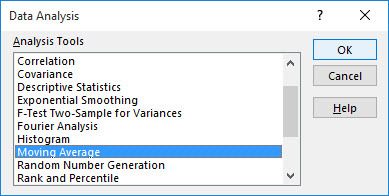 You probably haven't activated the Analysis ToolPak in your version of Excel. To activate it, go to File > Options > Add-Ins > Select "Analysis ToolPak" > Click "Go..." > Check "Analysis ToolPak" > Click "OK"
In the dialogue that follows, enter the input and output cells for your average, as well as your interval. In our example, our input cells are D3:D23, since those cells represent our Sales numbers, and our output cells are E3:E23, since that's where we want our 7-day rolling average to go. In the Interval input box, we put the number 7, because we want to take the rolling average over 7 days. There are a number of additional options in this dialogue you can play around with, including a feature that will automatically generate a chart from our output. 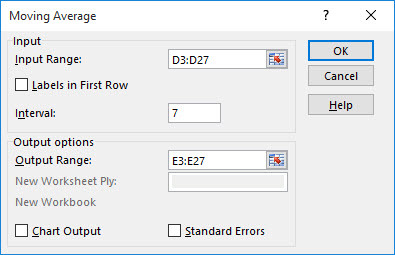 Excel will automatically fill in formulas to calculate the rolling average per our specifications. Note that the program returns #N/A! errors in the cells within which it is impossible to calculate a rolling average with our given 7-day interval. 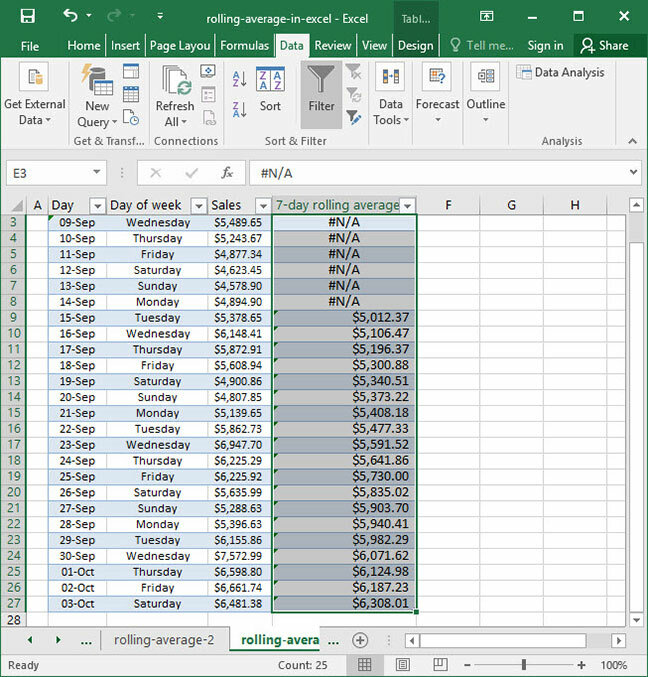 Now you know everything you need to calculate rolling averages in Excel. 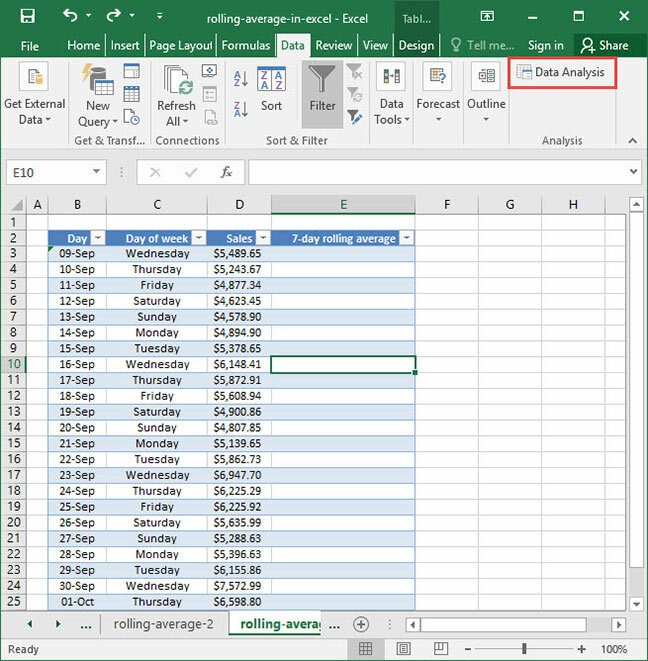 Use this handy tool to smooth out your data and control for seasonality and cyclicality when conducting analyses!